Daily Divination 5-30-11 The Star! Aquarius! Upliftment! Inspiration! And Neptune’s transition to Pisces! The Star! IMAX: Hubble 3-D journey to explore the faraway galaxies viewed by the Hubble Space Telescope in its travels throughout the cosmos. The moment I drew this tarot card, it reminded me that I forgot to add the Hubble film to my movie list on Netflix. Now that I’ve done so, it’s on to the divination message for today. It’s a perfect card for this Memorial Day weekend when so many planets, including the Moon today are in relaxing and comfort seeking Taurus. Sunny with temperatures in the high 80’s, with light breezes, a blue sky and puffy white clouds here and there, grace the day. What is even more beautiful (to me) and magical to boot is the night sky when the stars are bright and beautiful. Here in the mountains, without city lights, the night skies are enchanting and mystical. That’s the epitome of today’s message and it is associated with the words meditation and hope and that’s how we feel when we gaze up into a star filled sky! We can’t seem to help the associated feelings of stillness that the inner reflective mood that star-gazing supports and encourages. Stars connect us with our Soul. This is undeniably my most favorite card in the deck! The astrological sign that rules this card is Aquarius and the archetype of that sign, ruled by Uranus, represents the individual unconscious mind—we might even say “soul”. 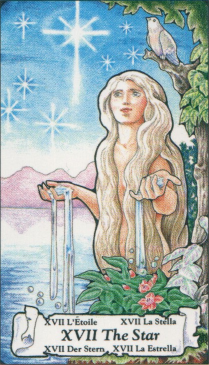 The image on most tarot cards of The Star picture a water scene and water is associated with healing and also emotions—we might say then that emotional healing and the flowing waters of the inner life are represented here. 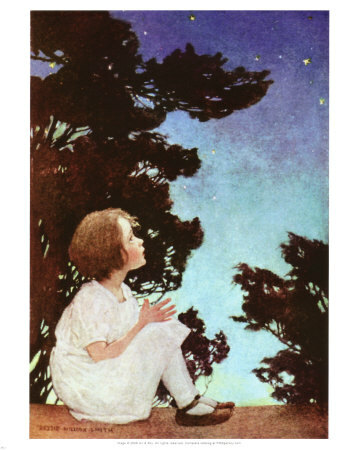 Star gazing puts us in touch with that inner flow and that is what we are searching for when we meditate—that same feeling of connection to ‘total mind’ that star-gazing produces within us. Total mind is the connection with ego or physical mind to soul-mind to bring wholeness and completeness to the psyche—it’s the feeling of missing nothing and being totally present and fully plugged in or connected on all levels. That’s why this card is often associated with intuition and why it is said that star-gazing is an act of meditation. By the way, a lot of people think Aquarius is a water sign, its Air and therefore associated with Mind and associate with visions or visionaries. I think of Uranus/Aquarius energy as flashes in the mind, intuitive flashes of guidance from the soul coming through wherever Uranus and Aquarius energy is in the chart. Neptune just moved through its sojourn in Aquarius–the linking of Universal Mind or Ocean of Cosmic consciousness which is Neptune filtered into our individual soul-mind which is Aquarius. Now Neptune is in its own sign, Pisces. We may, therefore, have glimpses from our connection to cosmic mind (Neptune) of the larger soul of humanity or the universe itself (Pisces). In other words, while we may have been getting flashes of the blueprint for our individual soul when Neptune was in Aquarius, now that it’s in Pisces, humanity at large could be plugged into the cosmos at large. We will have to see how that plays out—shared dreams, shared spirituality, shared visions! Intuitively, I’ve always felt that we can draw energy from the Sun, Moon, Mountain Tops and the Stars right into our self to heal, balance and energize our totally 4-body system (the physical, mental, emotional and spiritual). I do that regularly. Today’s cosmic communiqué is a reminder of connecting and drawing down the energy of the stars. While it’s lesser substitute, looking at Hubble Telescope images on the computer has the same effect—at least for me it does. I have a Hubble gadget on my i-google page. Viewing the night sky and space images can calm the mind and heart and open the channel of inspiration—the channel to spirit. When our mind and heart are calm we are open to the inner flow and can follow that flow into soul-mind and spirit world. 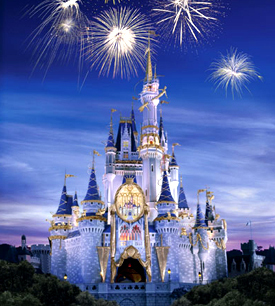 I wish you a Walt Disney Magic Kingdom kind of day! I highly recommend viewing that video! This card always seems so overly dramatic but who’s to say what is exaggerated as far as life experiences go? Only the experiencer! Certainly, the Joplin tornado could qualify as pretty dramatic and tragic. Talk about devastating change… wow! Ever notice that a circumstance that totally immobilizes one person creates a totally different response in a different person going through the exact same event? On CNN last night there was an audio/video clip of a group of individuals who sought shelter inside the cooler of a convenience store. One could only have a heartfelt, compassionate response while listening to their recorded experience. (links below) Yet, you could hear how people responded so differently and it was very interesting. One woman screamed out the name of jesus repeatedly, adding “father help me”. I found it interesting that she used the word me instead of the word us. After all they were packed in like sardines and it was a unified group experience; yet in the clip I heard, the woman called out for help for herself –not the others? (Maybe it was implied or intended. ) Yet, in contrast to this older sounding adult female, you could also hear the voice of a younger males. One young man was telling everyone that he loved them, “I love you guys man; I love everyone man, I love you, I love you guys.” Another young male voice said, “Yeah, me too, I love everyone.” And another young man was saying, “We’re good, we’re okay, we’re going to do it. Stay calm.” Meanwhile, the older female voice was screaming out jesus and father save me. I guess the point is that disaster and trauma—the kind that brings people to the moment of a perceived eminent death—brings out something different in each of us. In watching news reports on Joplin, I’m noticing how many people who relate their stories are conveying how they don’t remember getting where they ended up. Interesting; and one wonders if angels weren’t involved. One guy who was telling his story to Anderson Cooper on CNN said that when the tornado hit that he was in the house and when he came to, he was sitting in the front seat of his truck and had no idea how he got there. The archetype or motif of the 10 of swords, this energy, and the message with it has to do with the times when we need to embrace faith. The cooler crew of Joplin exemplifies this card’s meaning since it is about short-lived difficulties—things that look bad at the moment, feel terribly disastrous at the time, but are short in duration. It was that way for that group at least. Generally speaking now, focusing on the card meaning here, it’s about the light at the end of the tunnel and the need to remain focused and patient rather than in a panic being immobilized by fear. It’s about working with the forces surrounding you even in the darkest moments that life sometimes brings—that’s the conceptual message of this card. The Buddhists teachings, specifically in the famous Tibetan Book of the Living and the Dead, it is suggested that at the moment of death, the final feelings and thoughts are those that we carry over into the Bardo state and into our next lifetime. And so it is suggested that a mentally and emotionally peaceful state at the moment of death is most desirable. I’d like to think it’s like the young man you will hear on the recording link below who said that he was overcome with a surreal feeling of peace. One man whose truck was torn apart on the Interstate, when asked what his thoughts were just as the truck was being ripped apart, indicated that his thought was, “Here we go.” Makes you wonder if he isn’t an old soul who remembers how it goes. Souls who speak to me from the other side always say that death is like walking from one room to another; there’s nothing to it. They always say not to have any fear. That’s what I hear from them anyway. The reader will just have to take my word for it I suppose. One wonders about the cooler folks—the contrast of the woman in a panic screaming out the names of the deities causing alarm in the others versus the young men who seemed to permeate the group with thoughts, words and the energy of love. Interesting contrast perhaps having to do with soul age. Who knows for sure? Strange, but in watching (more like listening) to the recording, it transported me to my own similar memories from past lives of being in those types of situations. Familiar feelings of surrender and the calm… helping others to feel calm in a similar situation came to the forefront of my mind. 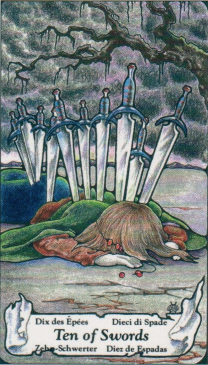 But I digress… let’s go to the bottom line message with the 10 of Swords. But just to interject first that many, including myself, are doing energy work (prayer work) for the souls of Joplin at this time on various levels, with a loving and compassionate heart. 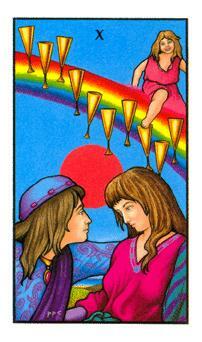 After the clouds and the rain and the wind, there will be a rainbow–that’s today’s card meaning. Further, the message is that no matter what the trauma, we do come through the other side undeniably changed. The Sun in Gemini relates to the 10 of Swords archetype—same energy. The element of AIR is representative of both the astrological Gemini and the suit of Swords. Anyway, Gemini (the twins II) that is associated with the 10 of swords represents the quality of being of two minds and carries the quality of someone who is either on top of the world or feeling hopeless demise… like Libra is sometimes, Gemini has those two extremes. With Gemini it is either the best of days or the worst of days with no in-between. 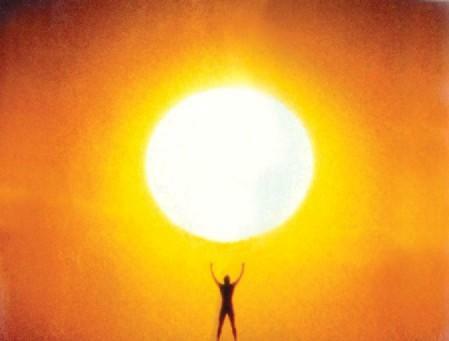 And with the Sun (Sun in Gemini), we’re talking about purpose itself, essence itself. I supposed a bottom line correlation of Sun in Gemini to the 10 of swords has to do with split purpose. Let’s leave Joplin out of the interpretation for a moment. What I’m sayen’ is general in that sometimes what happens in life has a double or twin (Gemini) meaning. Sort of like that “good news, bad news–who knows?” proverb you hear quoted often. Gemini is about adapting to changing circumstances; and that’s another connection to the Sun in Gemini correlation to this card. So what’s today’s bottom line divination message? Life isn’t an either or situation (either perfect or hopeless) and most circumstances of life require us to adapt to change. It doesn’t do much good to panic or to panic others no matter what is going on, especially in the face of disaster. Sometimes life tests our mettle (shows our true character) and from those initiations we can learn a great deal about ourselves. Maybe that’s why they happen? I’ve found this blog to be a difficult one to write. I hope nothing here portrays insensitivity to those suffering in Joplin. My heart goes out to them with my prayers and a donation to the Red Cross as well. I just had a conversation with a friend who called me just after she visited a professional psychologist. This counselor decreed that my friend’s eating disorder was caused by the feelings surrounding a loss that occurred some 20 years ago. Wow, can it be that cut and dry and simple? Go home and grieve the loss and then presto-change-o, you’re healed? And pay the receptionist on the way out. Next?! My friend is one who intellectualizes her emotions and admits to being a bit of a workaholic. So there could be some avoidance issues. This individual has a strong-headed teenager, demanding corporate job, is involved in community activities and doesn’t afford herself much time to reflect. It’s a pickle! Her natal Moon is in Aquarius and the whole time we were talking today, I kept thinking about that. Why did her soul choose that Moon sign? One thing I can see is that if she were the soft-hearted weepy type, her intense, fiery teenager would probably run all over her. So that Moon sign is helpful to her in that regard. We all have the need to be focused, swift, and efficient to deal with in-your-face daily problems and to everything there is a time, turn, turn, turn–remember that song? To everything, turn, turn, turn; There is a season, turn, turn, turn; And a time for every purpose under heaven; A time to be born, a time to die; A time to plant, a time to reap; A time to kill, a time to heal; A time to laugh, a time to weep… My friend was calling me to turn the time because the therapist had her crying and she needed to return to work and turn, turn, turn handle corporate business! Another pickle! The card for today’s divination message is the 8 of wands which has the same calling-card as Mercury in Sagittarius. Events happen for so many different reasons and I love Byron Katie’s approach to it; she would say, “That event was supposed to happen. And how do we know that? Because it did.” That concept is pretty cut-and-dry too, but it is also very releasing of guilt or shame or anger and any of those feelings that can be attached to an event of the past–that’s true and if you don’t believe me, try it. And when we go back to the event in our mind or memory or when it bubbles up out of the sub-conscious, we have to re-visit it…. I mean there it is staring us in the face. Wayne Dyer talked about something called recapitulation and said it is like picking it up and taking it out. Like a bag of garbage, you have to actually pick it up to get rid of it! Shoving it back down will only cause problems–one may as well deal with it. But how? I’d think that with any event there are so many connectors or there is such relatedness to other souls and also the “divine mystery” of life, which sometimes we just have to accept. Why did this happen? Or why did you make this or that choice at the time that you did? Unless we intended to cause harm directly and with malice and with the intent of a cruel mean heart, then we did the best that we could do at the time, knowing what we knew then at that time. Or we reacted as we did, based upon many factors, some of which involved other souls–karmic stuff with past life factors. There could be a lot more going on than meets the eye! 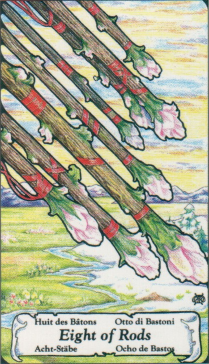 If you look at the image on the card of the 8 of Wands, there are no people, just a lot of energy. You get the feeling of a lot of energy going in one direction that seems unstoppable. I think that’s how some experiences of life are. We could call those pre-destined (or not). But one thing I’d feel more certain about saying is that everything happens for a reason and guilt or regret or even sadness should be released, because these emotions aren’t useful to us. I can understand the avoidance to doing the recapitulation process, but I’m not sure about the wisdom of doing it in the middle of a corporate work day. And I get how we all tend to want to suppress and repress painful memories—oh, only all too well do I get that! 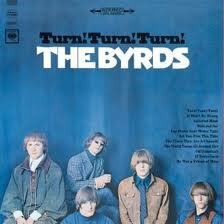 But to everything, turn, turn, turn and so on. Mercury in Sagittarius relates to this card. Mercury is related to conscious thought and information and Sag is a very restless energy. People who have a Sag Sun or a lot of planets in Sagittarius tend to be very fidgety, sometimes to the point of agitation. And yeah, a workaholic tendency and lots of activity would relate to that. I pulled this card today just before the phone call with my friend and by the way, I have her permission to write about this, assuring her that I’d leave out specifics. As I looked at this card while conversing with her, I kept getting that the situation from 20 years ago involved other souls and many other interconnected dynamics. Mercury is often associated with the left-brained conscious mind and Sagittarius (ruled by Jupiter) relates to the right-brained intuitive level of consciousness. This isn’t so much a paradox as a need to balance the two. This is someone who could benefit from divining or channeling from higher mind some deeper insights about the situation through meditation or a past life regression. These are insights that she can obtain within herself in the right timing… turn, turn, turn. Opening up the 5th chakra (throat chakra) is part of the equation that relates to the archetypes around the 8 of Wands and Mercury in Sagittarius. My friend, as is true with many others, feels like if she talks about certain things that a floodgate will be opened and she won’t be able to stop the flow or shut the gate. I give her credit for seeking out a counselor in her area—I know her very well and I think it’s good that she consults with someone other than me. She likes being face to face with someone and we live very far apart. But she ends up getting a double session because she calls talks over her sessions with me afterwards. 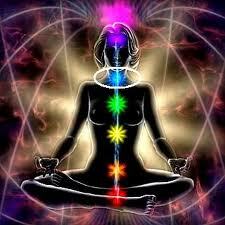 Some people need to close down their 5th chakra a bit more and now I am going into the opposite polarity. Some people share more information than they perhaps should with others, creating an end result of feeling dis-empowered. Do you know people like this? They tell you things that are really the business of their own intimate connection to their own soul and higher self. And once its brought into the outer environment, it loses its specialness and psychic charge. Sometimes very personally sacred information should be kept sacred and not tainted by sharing it with the outer world. And the other polarity has to do with releasing energy at that chakra. In the case of my friend, she does this through her singing—she has a beautiful voice and a very strong one. Energy that does need to be released can be done so through music; that’s where such energy becomes transmuted or transformed and released. If there is no song in your heart, then speaking with a counselor or therapist of some kind can work to clear the 5th chakra too. If the counselor can help connect you with the higher mind for self-realization, that’s all the better. But sometimes a paper and pen work just as well, as in journaling—a daily diary can help one reach deep into the soul and connect with higher mind as well as clear energy. Another bottom line has to do with balance/imbalance. Why one overeats or with any addiction, it is ultimately an imbalance we’re trying to correct–albeit in an unhealthy way–so the real issue has to do with bringing the psyche back into balance. Does something need to be released? Or something taken in–like more of one’s Self? So these are really the core issues. An event from 20 years ago is only one part of it. I’ve gone on too long again. I hope today’s divination will be practical or useful in some way to the reader. Yeah, I know that I was all over the place in my the writing today… some days are like that. And that is the energy itself I’m writing about–sometimes trying to deal with issues with thought or left-brained consciousness isn’t enough and can lead to further confusion. We need to call on the right-brained part of ourselves in doing therapy and calling upon the intuition and higher mind is called for! Writing this post today has fired up my desire to work with past life regression therapy… I’m preparing to offer that for my clients soon. Daily Divination May 2, 2011 Individuated Spirituality, Jung, The High Priestess, the Moon, Intuition—can that blend with religion? I shuffled and pulled a tarot card for today, barely looked at it, setting it aside to answer a phone call from my sister. Our conversation eventually led to the subject of guilt and catholic confessions to a priest; she’s a practicing catholic—me, not. 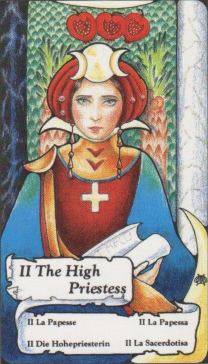 I just returned to my desk and realize now that the card I pulled for today was The High Priestess! Part of our talk included Jung’s view of Christianity, something that was refreshed in my consciousness yesterday after viewing a video. Roger Woolger, Ph.D. who is a Jungian analyst and past life regression therapist was commenting on Carl Jung’s Red Book and according to Woolger, after Jung deeply studied world religions while residing countries in the East, he drew some dramatic conclusions regarding the divine feminine being left out of western Christianity, to its demise. If I remember correctly, he quoted Jung as stating that western Christianity is diseased because of its lack of recognition of the feminine form of divinity (or the demotion thereof). My thought is that it is hardly an accident that the High Priestess card—the card of The Divine Feminine–aligns with my recent connection with Woolger, Jung and conversation with my sister on this very topic. The divine messengers broadcasting today seem to be sending me a signal to correlate this for today’s cosmic communiqué (or so goes my illusion). I note on the image of this card the symbols of the Moon on the priestess’s headdress as well as the cross on her chest, but most especially am drawn to the scroll in her hand. Looking at the scroll which keeps catching my eye, it’s speaking to me of the missing esoteric gospels that I’m thinking of—the gospel of Thomas and the gospel of Mary Madeline. The Secret Knowledge is always what I think of when I see this card–the ancient teachings from Egypt, etc. I also think of the Divine Feminine as the intuition that is within all of us which is our personal connection to divinity, which I personally see as lying outside of the pope in Rome and the local parish male authorities. Of course, that is my own opinion and judgment and how it is for me (and many others, I’ve noticed—an understatement). Many agree that our personal connection to the divine remains dormant until we awaken it deep within through personal effort. Religion, if used properly, can be like scaffolding around our personal spiritual growth. That’s the High Priestess archetype–personal spiritual effort via meditation and other personal devotions which part the veil to the world of the subconscious and divine levels of mind. A priest and church cannot do that for you, although they might facilitate it, providing the atmosphere. That’s what I see the purpose of any church to be—a quiet place to gather one’s thoughts and to be devotional until one can achieve that state on one’s own. Of course, I’m not talking about hell and brimstone preachers or screaming jezuz-freak churches—the catholic mass (church service) is much more passive, muted and quiet than those types of churches (I think). I’m no expert on churches per se, so I can only half-speculate about that. Anyway, searching deep within is what the High Priestess archetype is about and some organized religion may be able to aid in the initiation of that search if one can release attachment to dogma or move beyond it to true personal spirituality. 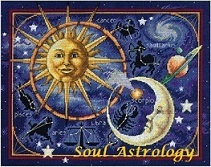 In astrological terms, The High Priestess relates to Moon energy and the feminine principle, intuition. Males carry Moon energy as well as females, of course—we all have a Moon somewhere in our psyche and natal astrological chart. The Moon rules the 4th house and is often associated with “emotions”. We often say that men who are able to allow themselves to be emotionally sensitive and compassionate are “in touch with” their feminine side. Women have a male side as well and when the male/female energy is balanced-within in either men or women, we are said to have attained “the marriage within”, merging the anima and animus, as Jung would call it. Jung identified the anima as being the unconscious feminine component of men and the animus as the unconscious masculine component in women. Jung stated that the anima and animus act as guides to the unconscious unified Self, and that forming an awareness and a connection with the anima or animus is one of the most difficult and rewarding steps in psychological and spiritual growth. Jung reported that he identified his anima as she spoke to him, as an inner voice, unexpectedly one day. 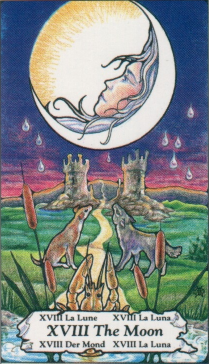 The High Priestess and the Moon itself represent the archetype of knowing that there is a uniting consciousness to all of life—this unity consciousness includes the subconscious and intuition. We find that many religious institutions (i.e. patriarchal religions) fear this unity part of individuation—thus the purpose for dogma. Why? I don’t have time today to list all the reasons–I defer to history which speaks for itself. My sister mentioned reading some catholic religious propaganda over the weekend which outlined the types of sins to confess to a priest in a confessional—one of those being having used tarot cards. This troubles her a great deal and we talked about it; she is right on the verge of individuation and truly spiritualizing, yet the dogma still has ahold of her. Of course, most people who read this blog would know what The High Priestess would say about what my sister read! The deeper wisdom is within my sister and she will gradually tap into it and her own High Priestess; she may then find the role of the catholic priest and confessional less important and have a more joyful and uplifting guilt-free experience in her church-going efforts. She’s not quite ready to cut out the middle-man and stand on her own spiritual feet, so-to-speak. When the subconscious is allowed to move and flow, we can get in touch with our true nature. Guilt and fear (two major religious power and control mechanisms) keeps us from being in tune with our inner knowing. Today’s message is not about christian-bashing; it’s more to do with getting in touch with the feminine Moon energy, the emotional side, so that a heart opening can occur, the unity of life can be revealed, and the answers within can be revealed. One needn’t call upon a catholic priest for this, but The High Priestess within. Oh, I tell you! An entire book could be written on this subject/topic, and many already have been. The few paragraphs above are not all-inclusive on this subject matter, of course, nor intended to be. For now, this is just a wave and hello from The High Priestess and the Moon reminding you that the feminine is just as important in spirituality as the masculine or patriarchal. Balance the two and the veil is removed and the “bride and bridegroom within” become one. Bottom Line: Be receptive to your intuition, trust your inner voice, let what is within flower–go beyond dogma, go deeper and be still! Use your emotions in a new way to recognize your heart’s path… that’s emotional wisdom! Exhilarating energy! Hearing the song in the heart! Recognizing the heart’s path without having to figure it all out! Floating in the heart-space between our thoughts and the unconscious directions of the soul! Go there! Today’s Cosmic Communiqué is about embracing the true inner self with a loving respect as we merge with lotus flower consciousness. 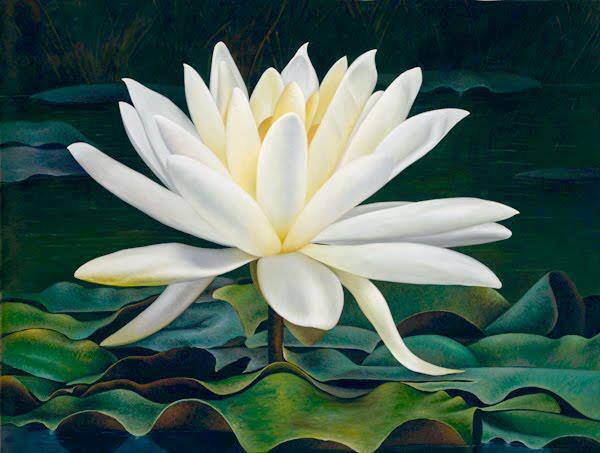 Every part of the lotus flower is used and thus gives an example for our own lives—to use everything, every part of it (especially our emotions), for our growth, evolution and enlightenment. I wrote about this very thing today’s newsletter. Nearly all parts of the lotus have a use. The leaf is used to treat fevers, irritability, etc. The seeds of the lotus are used as a tonic and medicine for lung and eye inflammation. The nodes of the root have nutritive astringent properties and are used to treat forms of bleeding and hemorrhaging. The sprout that grows out of the seed is used to quiet and calm excessive mental activity. Shamans string the seeds and wear them as an amulet or talisman for peace and serenity–they are known to open the heart center. Be in tune with the heart today by utilizing every experience of life through observation to recognize the directions of your soul. 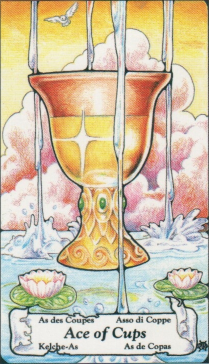 Water element energy relates to the suit of Cups in tarot. Yesterday I wrote about the astrological correlations of Cup energy relating to Pisces, Cancer and Scorpio. Emotions are the “Holy Grail” of psychic and spiritual development. The Ace of Cups and divine messengers shower us today with the message that new beginnings are occurring in the sphere of emotions! We’re beginning to emote differently and it’s a new way and a new day! Begin to trust your emotions in a way you’ve never done before—they are an aspect of your inner voice. An inner attunement to the emotional heart can be exhilarating! It’s a great day to get in touch with all this–the Moon is still transiting through Pisces, remaining there until tomorrow afternoon (1:33 PM, EDT). Nevertheless, in the spirit of divine timing, today’s message applies to you today, no matter what day you come across this blog post! Raise your cup and drink a toast to the wisdom of your emotional heart! PS– an additional message is this: It is time to enhance a warm and loving home environment!